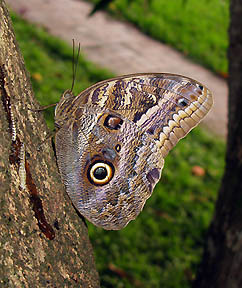 Owl butterflies (Caligo sp. ), also known as owl-eyed butterflies, are a group of mostly large butterflies characterized by a spot on the underside of the wing that looks remarkably like, you guessed it, an owl's eye. They occur across the New World tropics and subtropics, and nearly all of the 20 or so species prefer forests over open habitat, where they eat rotting fruit on the forest floor. When they rest, it is typically on either a tree trunk or large branch. The resting posture is with the wings closed and upright, thus only the underside of the wings are visible. The complex patterns on the wings make for some great camoflage, and for the most part, they are invisible unless flying. In flight, they often show off tints of bright blue/purple or yellow from the upper surface of the wings, but not nearly as much as the similar blue morpho butterfly. Ordinarily, just one photo is used to show an animal, but since butterflies undergo metamorphosis, a second picture is needed to show the caterpillar stage. 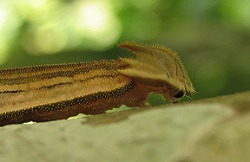 The caterpillars are quite unique-looking, sometimes with a swallow tail (two tips) and with an articulated head similar to a miniature triceratops dinosaur.